This series of Human Communication 101 articles entitled CONVERSATION ANALYSIS 101 is all about analyzing talk in social interactions. Conversation appears to be a uniquely human social activity. In its non-institutional, informal forms, it requires a minimum of two people who freely alternate in taking turns at talk. Conversations are typically highly coordinated activities in which all participants collaborate to ensure that they are attended to, heard and understood. Conversation is the exemplary way that humans use language to participate in face-to-face social interactions. First, we begin with a working definition of conversation. Then, with a view to understanding how conversations can be analyzed, we compare two leading analytical approaches: discourse analysis and conversation analysis. From this point on we focus on selected findings of the conversation analysis approach. Initially, we consider a fundamental unit of conversation known as the adjacency pair. Then we describe a rule-governed conversational management procedure that accounts for how turns at talk are allocated in real time, i.e. the four rules of turn allocation. Afterwards, we examine the phenomenon of overlapping talk. Using the rules of turn allocation, we explain why certain types of overlap are considered to be accidental whilst others are considered to be willful interruptions. We also review different ways in which conversation participants resolve the conflict of overlapping talk. Next, and again by reference to the turn allocation rules, we examine silences in conversation and demonstrate how these can be perceived as either gaps or lapses. In addition, we examine how specific silences are perceived to be attributable to one conversation participant rather than another. Finally, we conclude with an extended example of conversation analysis in action. This uses actual, real world data to demonstrate the analytic steps required to conduct a thorough analysis of any conversation. 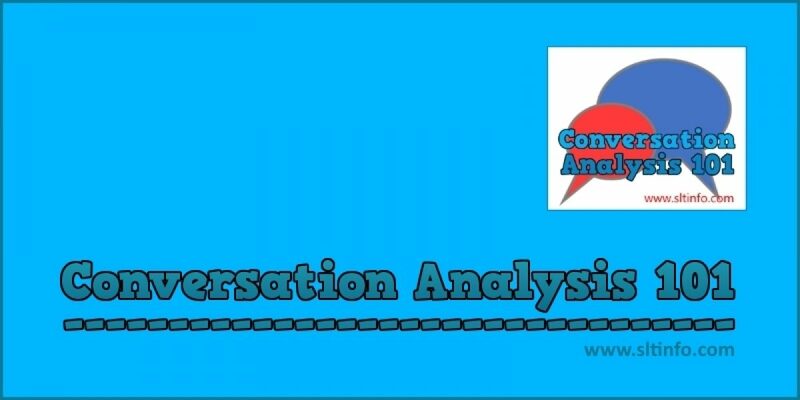 Conversation Analysis 101 is completed with some self-test exercises and activities and suggested answers are provided. CONVERSATION ANALYSIS 101 assumes no prior knowledge of either grammatical or linguistic analysis. Some understanding of ‘parts of speech’ (e.g. nouns, verbs, adjectives) would be helpful but not necessary, as links are provided to supporting materials as required. Question 2: Function of Minimal Turns?